A man has appeared in court in connection with a series of fires which affected properties on the Orkney island of Sanday. 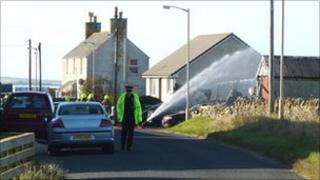 Leonard Cairns, 52, appeared in private at Kirkwall Sheriff Court, charged with wilful fireraising. Twenty-two people were moved to safety after three buildings - a shop, a garage and a recycling centre - were affected in Kettletoft early on Monday. Mr Cairns made no plea or declaration and was released on bail.